It’s not often a Division II football player makes the leap into cooking—even though there is an overlap of adrenaline, stress, sweat, and, most importantly, teamwork. But for Jason Stanhope, who played football at Washburn University, that was enough. Deciding to leave the pigskin behind to pursue cooking, Stanhope graduated from Le Cordon Bleu in San Francisco. But it was a pivotal night in Peru, where Stanhope was then working, that rocketed him into his professional career. Stanhope moved to Cuzco as a student to complete his externship at the Hotel Monasterio. When the fish cook fell sick, Stanhope proved an able substitute, and his career-fueling confidence was born. Stanhope went on to cook throughout Peru with the Orient Express Hotel Group before returning to the States and taking a job first at Forty Sardines in Kansas City, where he worked with James Beard Award-winning Chefs Michael Smith and Debbie Gold. A lateral move took Stanhope east in 2008, to a chef-tournant position at FIG in Charleston, working with another James Beard Award-winner, Chef Mike Lata. 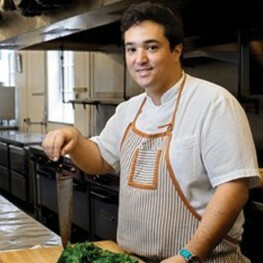 Stanhope helped Lata battle it out in Kitchen Stadium on Food Network’s “Iron Chef America” in 2010. And he now runs Lata’s kitchen as chef de cuisine of FIG, where Stanhope continues to explore local products, develop new recipes, and enrich Charleston’s food community.